Carpal tunnel syndrome (CTS) is the most common peripheral compressive neuropathy, accounting for 90% of all compressive neuropathies. It is defined as the impairment of motor and/or sensory function of the median nerve as it traverses through the carpal tunnel. (See the images below.) It is caused either by intrinsic swelling of the median nerve or by extrinsic compression of the median nerve by one of the many surrounding structures of the wrist. Plain radiographs have no role in the evaluation of carpal tunnel syndrome except for their ability to show the anatomic relationship of the carpal bones and evidence of severe prior trauma or fractures. Helical computed tomography (CT) scanning is more sensitive than plain radiography in revealing subtle bony trauma and misalignments and can be used to measure the cross-sectional area of the carpal tunnel. Plain radiographs usually do not reveal ligamentous or soft tissue abnormalities but may be useful to exclude frank fractures or chronic degenerative/posttraumatic morphologic abnormalities. CT scanning does not reveal ligamentous or soft tissue abnormalities to any degree. Axial scanners are even more limited, since they do not allow adequate multiplanar or 3-dimensional (3D) reconstructions. Ultrasonography is operator and equipment dependent. Although musculoskeletal ultrasonography using high-frequency transducers is widely used in Europe, familiarity with and training in the performance and interpretation of carpal tunnel ultrasonography is still variable, more so in the United States. MRI is useful for the evaluation of all of the intrinsic structures of the wrist (including the carpal bones) but may not be widely available, is technique and equipment dependent, can require up to 45 minutes to complete an examination, and has a number of contraindications (eg, cardiac pacemakers, older aneurysm clips, new stents or aortic valves, ferromagnetic ocular fragments). A number of clinical processes can create symptoms similar to carpal tunnel syndrome, originating more proximally in the neural pathway of the median nerve. These include multiple sclerosis, cervical radiculopathy, Pancoast tumor, brachial plexitis or brachial plexopathy, pronator syndrome, ulnar or radial neuropathy, generalized neuropathy, and median nerve contusion. 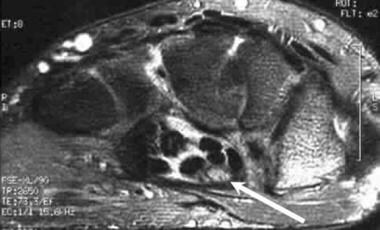 Although the appearance of carpal tunnel syndrome is fairly distinctive on MRI, differential possibilities include contusion and lipofibromatous hamartoma of the median nerve. A clinical history of recent trauma or a longstanding mass often allows the exclusion or inclusion of these etiologies in the differential. Plain radiographs are useful for evaluating the wrist and carpal bones for trauma and fractures (especially the hook of the hamate and the tubercle of the trapezium), severe osteoarthritis, and other arthropathies. Plain films are of limited use in diagnosing or evaluating carpal tunnel syndrome. They do not effectively visualize the small soft-tissue structures of the carpal tunnel, many of which can be involved in the syndrome. A carpal tunnel view of the wrist on plain films provides only a very rough idea of the cross-sectional area of the carpal tunnel. CT scanning is useful for its ability to display and evaluate the cross-sectional volume of the carpal tunnel and for detecting subtle calcification in the tendons within the canal. CT also provides an excellent tool for evaluating the carpal bones through multiplanar and 3D reconstructions. CT is limited in its ability to visualize the median nerve and tendons of the carpal tunnel well enough to allow a definitive differential diagnosis to be rendered. Therefore, other methods of visualizing the soft tissues of the carpal tunnel are preferable. Carpal tunnel syndrome. 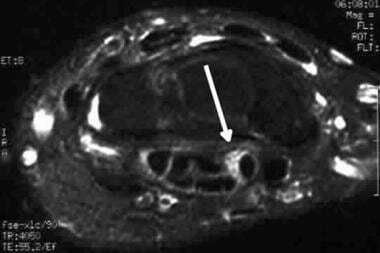 Normal findings of isointense to hypointense appearance of the median nerve on fast spin-echo T2-weighted MRI (arrow). Note the fairly well-defined nerve fascicles within the median nerve sheath. Regardless of the etiology of carpal tunnel syndrome, changes in the median nerve are similar. Diffuse swelling or segmental enlargement of the median nerve may be demonstrated (usually seen best at the level of the pisiform). The median nerve may flatten (usually demonstrated best at the level of the hamate), and palmar bowing of the flexor retinaculum may be noted (usually demonstrated best at the level of the hamate). Increased T2-weighted signal intensity within the median nerve occurs, which is demonstrated best on axial fast spin-echo (FSE) T2-weighted images. If FSE signal sequences are not available, axial gradient-recalled echo (GRE) or inversion recovery (IR) sequences also are sensitive to the increased edema in the median nerve that accompanies carpal tunnel syndrome. MRI also is useful in detecting and characterizing space-occupying lesions, such as neuromas, ganglion cysts, lipomas, and hemangiomas. 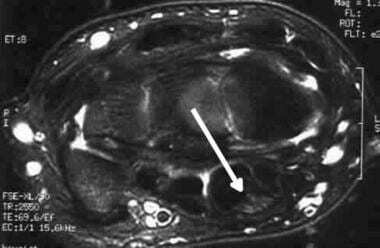 Enlargement or swelling of the median nerve proximal to the carpal tunnel, termed a pseudoneuroma, has been documented using MRI. Flow-sensitive sequences or dynamic contrast-enhanced MRI can detect a circulatory disturbance causing carpal tunnel syndrome, which is a cause separate from deformation or compression of the median nerve. One of 2 abnormal patterns of median nerve enhancement is usually demonstrated: marked enhancement of the nerve (attributed to hypervascular edema) or noticeable lack of enhancement (attributed to nerve ischemia). As with the symptoms of carpal tunnel syndrome, MRI findings in the syndrome may vary with wrist position: flexion or extension of the wrist during the scan can alter the visualization of the median nerve from marked enhancement to complete lack of enhancement, presumably because of mechanical obstruction of blood flow to the nerve. These actions are associated with exacerbation of clinical symptoms. Attempted surgical therapy for carpal tunnel syndrome may result in incomplete release of the flexor retinaculum. This can be detected by a residual increase in T2 signal of the median nerve within the carpal tunnel and by direct visualization of the still-connected fibers of the retinaculum. Transverse carpal ligament release from the hook of the hamate can cause the contents of the carpal canal and/or the flexor tendons to demonstrate a volar convexity caused by the loss of the normal roof support of the flexor retinaculum. 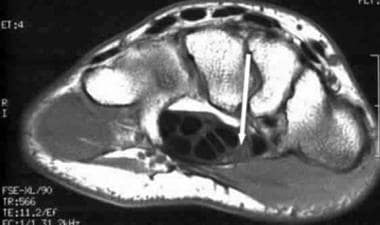 In addition to incomplete release of the flexor retinaculum, postoperative MRI changes in failed carpal tunnel surgery include excessive fat within the carpal tunnel, neuromas, scarring, and persistent neuritis. A normal postoperative finding is widening of the fat stripe posterior to the flexor digitorum profundus tendons. MRI studies following carpal tunnel release may demonstrate an increase in carpal tunnel volume of up to 24%, often accompanied by a change in shape from oval to circular, resulting in increased anteroposterior and mediolateral diameters. Early detection of the subtle changes of carpal tunnel syndrome requires soft tissue discrimination that is not possible using standard radiographs or CT. 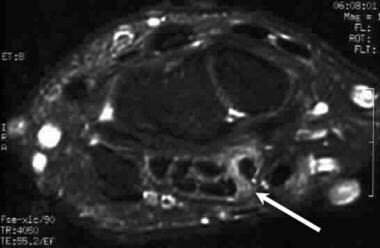 The ability to evaluate the cross-sectional morphologic and signal characteristics of the medial nerve and adjacent structures makes MRI invaluable in characterizing normal anatomy and abnormal pathology in the carpal tunnel. Significant differences often are present in patients with carpal tunnel syndrome, despite the subjective flattening of the median nerve at the lateral and distal carpal row. Flattening ratios have been used to document statistically significant flattening of the median nerve at the level of the hamate. The median nerve may display enlargement or dilation at the level of the pisiform and concomitant compression and flattening at the level of the hook of the hamate. Since carpal tunnel involvement is bilateral in as many as 50% of patients, comparison with the contralateral wrist can be misleading. Alterations in the median nerve signal intensity may represent edema or demyelination within neural fibers and thus are somewhat nonspecific. T1 and T2 signal intensities may be decreased when fibrosis of the median nerve is present. Evaluation of swelling is accomplished by comparing the cross-sectional area of the median nerve at the level of the pisiform and hamate to the cross-sectional area of the median nerve at the level of the distal radius. Carpal tunnel syndrome. Carpal and Guyon tunnels. Transverse 5-12-MHz ultrasonogram shows the proximal level of the carpal tunnel delimited by the pisiform (P) and the scaphoid (S). The flexor tendons and median nerve (MN) extend through the carpal tunnel, with the nerve lying palmar and radial. The flexor retinaculum (open arrowheads) forms the roof of the carpal tunnel and the floor of the Guyon tunnel. At the level of the pisiform, the ulnar nerve (U) courses medial to the ulnar artery (solid arrowhead) within the Guyon tunnel. * = flexor pollicis longus tendon. From Martinoli C, Bianchi S, et al. US of nerve entrapments in osteofibrous tunnels of the upper and lower limbs. Radiographics 2000; 20:S199-S217. Used by permission of the authors and RSNA. Carpal tunnel syndrome. Carpal and Guyon tunnels. Transverse 5-12-MHz ultrasonogram shows the distal level of the carpal tunnel, delimited by the hook of the hamate (H) and the tubercle of the trapezium (T). The flexor retinaculum (open arrowheads) forms the roof of the carpal tunnel. The flexor tendons and median nerve (MN) extend through the carpal tunnel, with the nerve lying palmar and radial. At the level of the pisiform, the ulnar nerve courses medial to the ulnar artery (solid arrowhead) within the Guyon tunnel. At the level of the hamate, the ulnar nerve divides into two terminal branches, a deep motor branch (curved arrow) and a superficial sensory branch (straight arrow). From Martinoli C, Bianchi S, et al. US of nerve entrapments in osteofibrous tunnels of the upper and lower limbs. * = flexor pollicis longus tendon. Radiographics 2000; 20:S199-S217. Used by permission of the authors and RSNA. Since the shape of the nerve varies as it passes through the tunnel, indexes have been introduced to better quantify abnormal findings; a nerve cross-sectional area greater than 9 mm2 at the level of the proximal tunnel is reported to be the best criterion for the diagnosis. A good correlation has been demonstrated between the measured ultrasonographic area of the median nerve and the degree of findings of EMG or functional outcome after surgery. Reduced transverse sliding of the nerve beneath the retinaculum during flexion and extension of the index finger also may be seen, but this sign is harder to quantify and may be too subjective. Only a few studies have compared ultrasonography with MRI in evaluating carpal tunnel syndrome, but these have demonstrated that ultrasonography is capable of producing results similar to those of MRI. MRI has been shown to be superior to ultrasonography in the identification of subtle cases, and MRI demonstrates better sensitivity than color and power Doppler ultrasonography in showing changes caused by nerve edema and blood perfusion abnormalities. Chen YT, Williams L, Zak MJ, Fredericson M. Review of Ultrasonography in the Diagnosis of Carpal Tunnel Syndrome and a Proposed Scanning Protocol. J Ultrasound Med. 2016 Nov. 35 (11):2311-2324. [Medline]. [Full Text]. Wipperman J, Goerl K. Carpal Tunnel Syndrome: Diagnosis and Management. Am Fam Physician. 2016 Dec 15. 94 (12):993-999. [Medline]. [Full Text]. Padua L, Pazzaglia C, Caliandro P, Granata G, Foschini M, Briani C, et al. Carpal tunnel syndrome: ultrasound, neurophysiology, clinical and patient-oriented assessment. Clin Neurophysiol. 2008 Sep. 119(9):2064-9. [Medline]. Koh SH, Kwon BC, Park C, Hwang SY, Lee JW, Kim SS. A comparison of the performance of anatomical MRI and DTI in diagnosing carpal tunnel syndrome. Eur J Radiol. 2014 Nov. 83 (11):2065-73. [Medline]. Duncan I, Sullivan P, Lomas F. Sonography in the diagnosis of carpal tunnel syndrome. AJR Am J Roentgenol. 1999 Sep. 173(3):681-4. [Medline]. Wiesler ER, Chloros GD, Cartwright MS, Smith BP, Rushing J, Walker FO. The use of diagnostic ultrasound in carpal tunnel syndrome. J Hand Surg [Am]. 2006 May-Jun. 31(5):726-32. [Medline]. Filius A, Scheltens M, Bosch HG, van Doorn PA, Stam HJ, Hovius SE, et al. Multidimensional ultrasound imaging of the wrist: Changes of shape and displacement of the median nerve and tendons in carpal tunnel syndrome. J Orthop Res. 2015 Sep. 33 (9):1332-40. [Medline]. Liao YY, Lee WN, Lee MR, Chen WS, Chiou HJ, Kuo TT, et al. Carpal tunnel syndrome: US strain imaging for diagnosis. Radiology. 2015 Apr. 275 (1):205-14. [Medline]. Chen J, Chen L, Wu L, Wang R, Liu JB, Hu B, et al. Value of superb microvascular imaging ultrasonography in the diagnosis of carpal tunnel syndrome: Compared with color Doppler and power Doppler. Medicine (Baltimore). 2017 May. 96 (21):e6862. [Medline]. [Full Text]. Bonel HM, Heuck A, Frei KA, et al. Carpal tunnel syndrome: assessment by turbo spin echo, spin echo, and magnetization transfer imaging applied in a low-field MR system. J Comput Assist Tomogr. 2001 Jan-Feb. 25(1):137-45. [Medline].